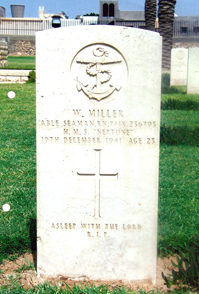 MILLER, Able Seaman, WILLIAM, P/JX236793. H.M.S. Neptune. Royal Navy. Age 23. Husband of Jane Miller (nee Munro), of Greenock. Tripoli War Cemetery 5. D. 1.